Strawberries and cream is a dessert that brings back many memories of my childhood in Medellín because I loved it but rarely enjoyed since my parents couldn’t afford it. Of course, my mom and dad would occasionally try to buy it on the condition that my sister and I had to share. You can imagine the huge fights we had whenever we had to divide it into EQUAL portions. The weekend plan was to go to see the planes take off at the Olaya Herrera airport, or go to the Campos de Paz cemetery which is on the other side the street from the airport, and then, if there was enough money, we would buy a cup of strawberries and cream. In a previous post I told you how I loved going to see the planes take off, but I also loved going to the cemetery. Back then, Campos de Paz did not have the amount of graves it has now and the hills were only covered with grass giving it that country vibe. My cousins​​, my sister and I used to go all the way up to the top and then run all the way down at full speed, while trying not to step on the “dead people”. We used to do this several times until we were exhausted. After all that chaos the big prize was eat a delicious cup of strawberries and cream. You will find a ton of places selling this dessert in Colombia, so much so, that going out to eat strawberries and cream is a very popular family weekend event. Unlike other countries, we make ours a bit more simple and usually we only combine the whipped cream with the strawberries. 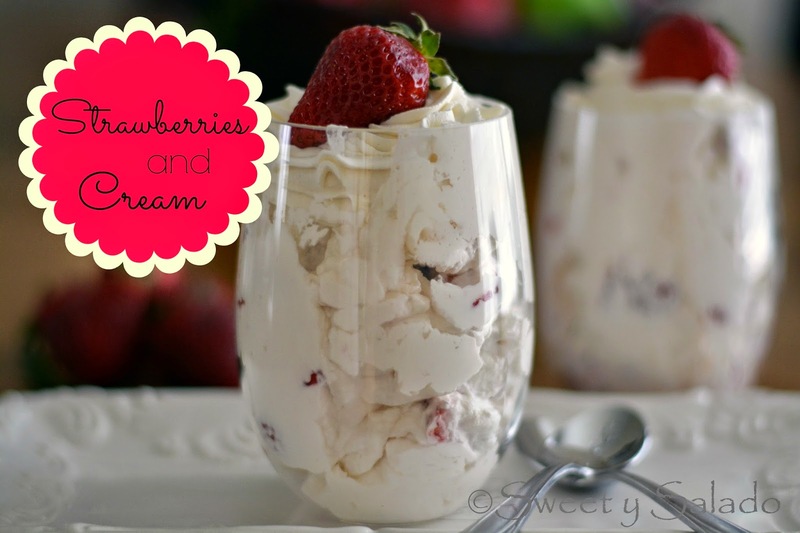 This dessert is simple, quick and easy to make, and simply delicious. 1. Wash and dry strawberries really well and then remove the green leaves with a knife. Then, cut them into bite size pieces and put them in a large bowl. 2. Add the sugar, stir well and let them rest for about 30 minutes so they can release their juice. 3. 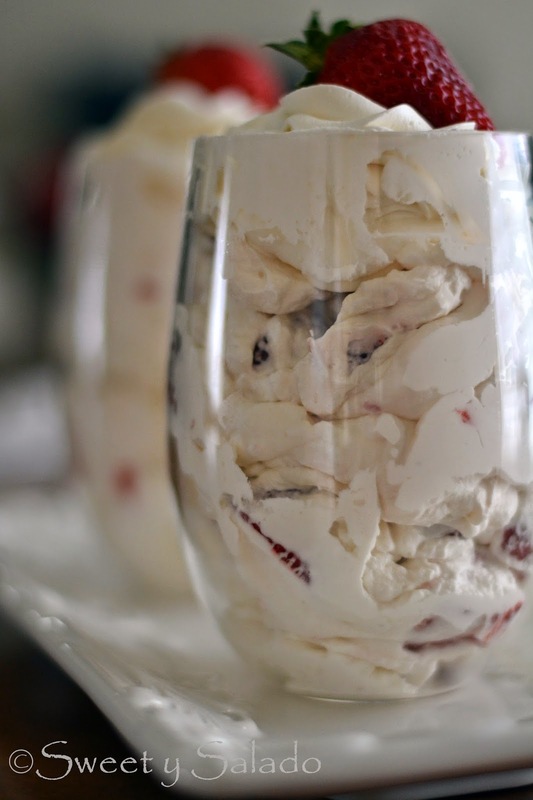 Mix them well with the whipped cream and serve them in a glass. You can decorate them with sweetened condensed milk and more strawberries on top.